Derbyshire Times. 16th April 1884. 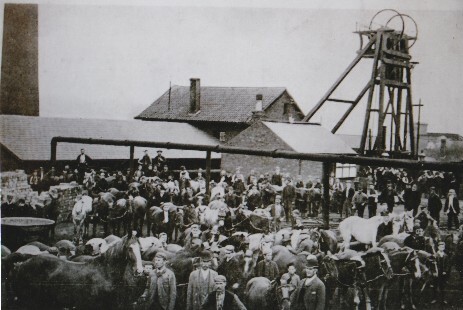 A dispute has arisen at the Alma Colliery where 300 hands are at present idle. Over a week ago a rumour was current that The Clay Cross Company had given their men and boys fourteen days notice that a reduction would be made in their wages. The men employed getting coal at Alma were informed that they would be paid a reduction of 2d per ton on all coal got. Early on Friday morning a fire of a very serious character broke out in the lamp office. The colliery is the property of Mr. Thomas Houldsworth Clay Cross and employs some 500 hands. Mr Houldsworth Managing Partner of the Pilsley and Alma collieries. Was interviewed on Tuesday and consented to meet the demands of the men by granting the 10% advance – some 1,300 hands are concerned. An inquest was held by Mr. C. G. Busby J. P. at the Chesterfield and North Derbyshire Hospital on Thursday morning upon the body of Thomas Burton of New Tupton who met with an accident at the Alma colliery North Wingfield on Tuesday. Stephen King miner New Tupton stated he was employed at the Alma colliery and was in charge of No. 7 stall. He went to work at 6.00 a. m. and the accident happened at 7.30 a. m. (More details followed). One hundred and seventy men and boys have been thrown out of employment by the closing down of the Alma colliery North Wingfield which the management have been reluctantly compelled to do owing to the heavy expenditure of the working of the mine. Fletcher and Cheetham beg to inform the public that they are now manufacturing Encaustic and flowered floor tiles, coke furnace bricks and flue bricks. Higginnbottom earthenware dealers Market Place Chesterfield. For sale a coal known as the “Alton” seam underneath seventy-nine acres of land at Handley. The land is situated about 1½ mile from Stretton Station and 3 miles from Clay Cross Station. The Clay Cross Company is about to sink another colliery at Mickley Higham. The seams to be won are the Blackshale and Tupton at a depth of 250 yards. When completed the colliery will find employment for 400 men. Wanted tenders for sinking a pair of shafts twelve feet in diameter to the Blackshale seam at Shirland colliery. The estimated depth is 120 yards. Blackshale pit: heading with bars. 4/8d per yard. Was 6/3d. cutting 2/2 ½ d 2/6d. Tupton pit: heading with bars 4/6d 5/-. In the Chancery Division of the High Court of Justice before the Master of the Rolls the usual order for the winding up of the Shirland Colliery Company Ltd. was made. There was no opposition. Mr. E. Houfton the manager has opened a depot for the sale of coal at the Chesterfield station. Orders may be given either to Mr. Charles Fieldsend at the depot or Mr. John Spencer Newbold Road or Mr. Higginbottom Low Pavement. Prices on application. To be sold the whole of the fixed and loose plant comprising of a pair of marine engines with link motion with 12 inch cylinder and 24 inch stroke, headstock and pulley wheels, egg ended boiler 27 feet x 4 ½ feet by Fletcher of Derby, haulage engine with boiler combined double cylinder 8 inch diameter and 12 inch stroke with 5 ½ feet flywheel, 4 feet drum by Hyde and Son Nottingham. Clay Cross number one colliery, Egstow, sunk in 1837 to the Blackshale seam. Clay Cross number two colliery, Church Hill Clay Cross, sunk in 1850. Clay Cross number three colliery, Church Hill Clay Cross, sunk in 1852. Clay Cross number four colliery, Tupton, sunk in 1850. Clay Cross number five colliery, Morton, sunk in 1865. Clay Cross number six colliery, Morton, sunk in 1874. Clay Cross number seven colliery, Parkhouse, Danesmoor, sunk in 1867. Clay Cross number eight colliery, Flaxpiece, Danesmoor. (Date of sinking unknown). Clay Cross number nine colliery, Avenue, Wingerworth, Blackshale pit, sunk in 1881. Clay Cross number ten colliery, was to be at Avenue but was never sunk. Clay Cross number eleven colliery, Old Avenue, Wingerworth, sunk in 1857. 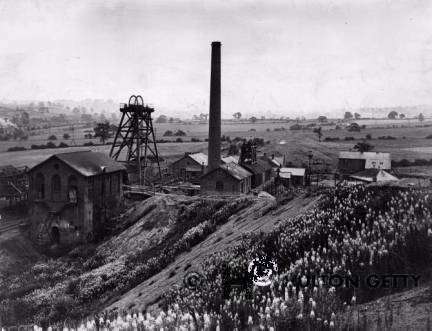 Clay Cross, Alton New colliery, sunk in 1875. A number 10 pit was contemplated at Avenue but never sunk. No 9 was sunk by the CXC but No.11 pit was actually sunk in the 1850's by the Wingerworth Colliery company and purchased by the CXC later on and mothballed until the 1880s. The Clay Cross company was founded in 1837 by George Stephenson the railway pioneer to produce coal, iron ore and iron and limestone. The original company being named after him Members of the board of directorship were, George and Robert Stephenson, George Carr (Lord Wolverton), William Jackson (Sir) J.P., Joshua Walmsley (Member of Parliament for Leicester (Sir)). His son-in-law Charles Binns (Stephenson’s private secretary). Who was works manager, George Hudson, S.Morton Peto, M.P. (Sir), Joseph Sanders and E.L.Betts were the financial backers who were with William Jackson and Morton Peto partners in the firm of Peto, Brassey, Betts and Jackson contractors for and builders of The Canadian Grand Trunk Railway a link between the Clay Cross company and the North Midland Railway company. Coal was mined in the Clay Cross area on a small scale prior to the arrival of Stephenson's Derby to Leeds railway in the middle of the 1830's. What was needed was an injection of cash into the area and better transportation which the railway was to provide, the Clay Cross tunnel operations also opened up several seams of coal which helped the company realist the potential of this area. When George Stephenson died in 1848 his son Robert who was by now an MP. succeeded his father as the largest shareholder in the company. The company by now was concentrating on the production of iron as by 1846 the price per ton of coal had fallen drastically and as a result there was a glut of coal on the market, however, the companies four pits remained open Robert later sold his shares in the company to Peto, Walmsley and Jackson over a disagreement about a contract to supply coal to London by the London and North West Railway. Stephenson claimed that the contract to transport 60,000 tens of coal from Clay Cross to London was unprofitable for the railway company. (In 1870 one tenth of all the coal reaching London was from Clay Cross, 385,632 tons in all). By 1871 Sir William Jackson had purchased all of the companies interests and became the sole proprietor of the company which he made into a limited company in 1913. The whole of the directorship were Jacksons. On the centenary of the company the Parkhouse, number seven or 'catty' pit was working two seams, the Tupton and Threequarter. Further collieries were purchased by the company in 1920 it purchased Wingfield Manor colliery near Alfreton and in 1924 it took over Bonds Main colliery at Temple Normanton. Derbyshire Times. 25th October 1890. On Saturday at Chesterfield County Police Court a case of very importance to miners came for hearing in which William Woodhouse a putter employed at the Clay Cross Company’s Avenue pit North Wingfield was summoned for an offence against the Coal Mines Act for refusing to obey the lawful command of a deputy at the colliery on 7th October. The defendant was a putter employed at the no. 9 Avenue colliery and on the date named was practically wasting his time on account of there not being sufficient work in that part of the mine where he was engaged owing to the absence of men. The deputy drew the attention of the defendant to the fact that he wanted him to go putting in another part of the mine. The defendant positively declined to go and used bad language to the deputy and stated he would not go either for the deputy or anyone else. There was not the slightest doubt about the man refusing to go and he said he would see the deputy somewhere else before he would go into another stall. He was fined 10/- plus costs. On Saturday twenty-three colliers employed at the Clay Cross Company’s Avenue pit were summoned for absenting themselves from work without lawful excuses for which the Company claimed compensation at 5/- per day. The bench made an order to pay compensation and costs. On Tuesday evening about one hundred persons sat down to an excellent supper at the home of Mr. W. Dore at the Queens Head Inn to celebrate the successful sinking of a colliery at Parkhouse by the Clay Cross Company. The sinking of the shaft has been entrusted to Mr. H. Green who has given great satisfaction. The pit is about 177 yards deep and an excellent bed of Blackshale coal has been found. The pit is situated closed to the Erewash Valley railway line, which will afford a great facility for getting the coal away. After supper Charles Binns Esq. presided for the rest of the evening. An inquest on a Clay Cross coal miner. A piece of stone three feet across fell from the roof of a tunnel at Pilsley West Colliery (Wooley Moor) and struck Harold Kymes 43 a miner who died in Chesterfield Royal Hospital. N.B. This colliery never produced any coal at all. Clay Cross Colliery & Ponies. Could be No.7. Parkhouse. Last image Copyright Hulton Getty Images. Clay Cross No. 11. Avenue.